Though Death Cab for Cutie is known as a Seattle band, they originally formed in Bellingham, a little college town about an hour and a half north of Washington’s biggest city. It all began in 1997, as the brainchild of front man and founder Benjamin Gibbard, a Western Washington University student majoring in Engineering. Coming fresh off of releasing a short EP as part of a power pop band called Pinwheel, Gibbard composed a solo album using the name All-Time Quarterback! He asked Chris Walla to work with him, and together they recorded a cassette tape-only release on Elsinor Records, titled You Can Play These Songs with Chords. It was a local success, so the two recruited Gibbard’s roommate, Nick Harmer, as a bassist and drummer Nathan Good, and Death Cab for Cutie was born. Their first studio release, Something About Airplanes, arrived one year later to agreeable reviews. Their sad and angry, reverb-drenched debut drew a lot of comparisons to fellow Pacific Northwesterners Built to Spill, and the band was frequently dismissed as copycats. For their 2001 release, The Photo Album, the band experimented with a more piano, organ and synthesizer-oriented sound, resulting in a sharper sounding, poppier album in comparison to its predecessor. Gibbard sounds more retrospective and pensive, and by this point Walla was increasingly sought out as a producer. But despite the band’s seeming maturation, the album received mediocre reviews. Around this time, tensions were rising, and the band nearly broke up shortly after its release. Their collective upset is captured in “Stability,” an epic piano ballad with a long, deathly quiet outro. It was the last song on an EP bearing its name at the same time as Photo Album. Within the next year, that question would become obsolete. 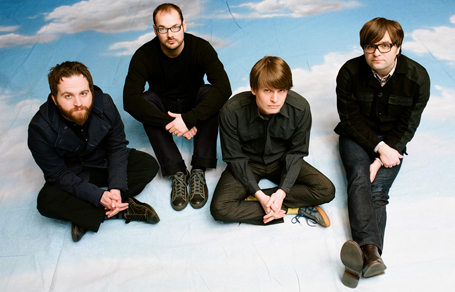 The band embraced drummer Jason McGerr, a long-time friend, and later in 2003, Death Cab for Cutie released the album that would change their careers forever: Transatlanticism. The album is simultaneously artier and more accessible, edgier and safer, with short upbeat songs contrasted with the desperate seven-minute long title track. It became a strong presence, with songs scattered all over movie and television soundtracks, in particular, “The O.C.,” the primetime teen drama whose star, Adam Brody, constantly plugged the band. When they performed during a scene of the show, it was clear they had broken through to mainstream media. As of April 2008, Transatlanticism was certified Gold. Late 2005 also saw the release of Plans, the band’s first album on Atlantic, and their glossiest and poppiest release to date. Although it received mixed reviews, it was a huge commercial success, peaking at #4 on the Billboard charts, resulting in a Grammy Nomination for Best Alternative Music Album and recently reaching Platinum sales in February 2008. The band is due to release Narrow Stairs this month, which could prove to stir things up among fans and critics alike with its toned down, more experimental sound and expanded song lengths. Regardless of its reception, the band remains a key figure in the increasing prominence of indie pop bands and an inspiring success story, proving the virtues of persistence.